300 Lb. Load Rating and 24â step width. Corrosion resistant, anti-magnetic, and easy to clean. 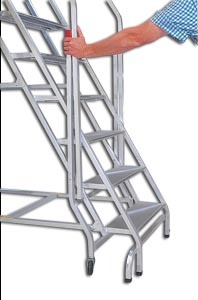 These lightweight and attractive ladders can be used in warehouses, libraries, schools, hospitals, and offices. The frame is constructed of 1â square high strength aluminum tube. Rugged, all welded step and side rail assembly with built in deep ribbed stair tread for sure footing. Top step is 15âD., remaining steps are 7.5âD. All ladders ship by truck partially knocked down. See Hybrid Ladder for details regarding caster and ladder options. FOB Shipping Point. Option 1-two 3" diameter swivel casters up front and two 3" fixed rear casters. Option 2- two 3" diameter swivel casters up front and two 3" swivel rear casters. Option 2 enables user to move ladder straight, laterally, or diagonally for closer positioning and tight cornering. "Grip & Roll" lift lever mobilizes all swivel casters. Product No. No. of Steps Top Step Height Base W x D Handrail Height Wt. (lbs.) Price Ea.